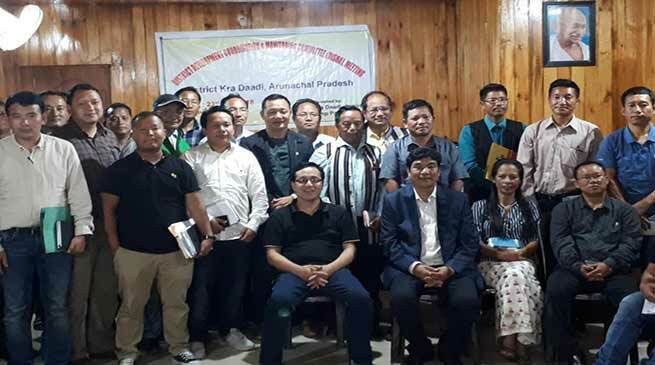 The district development, Coordination and Monitoring committee meeting of Kra Daadi held at the Deputy Commissioner office which was attended by all HODs of the district alongwith the local MLA Takam Pario. The purpose of this meeting was to ensure the better coordination among the government department for efficient administration and development. Addressing the meeting MLA Takam Pario said that ‘it should be our endeavour to serve the society with motto for development where one have been posted. Sincerity and dedication is key of success’. On the complain of the local people regarding the officers do not stay at the place of posting , Paro appeal the officer to be sincere and dedicate for the welfare and development of the people and area. Deputy Commissioner Pige Ligu in his address said that the main focus of such meeting is to to review all state and centrally sponsored schemes in the district and take stock of the progress and update the higher authority and district administration. He also said all query and answers related to the schemes of all department should be answerable and sent to the government from time to time and ask all officers to prepare progress report and also submit Utilisation certificate for all those schemes which have been completed. He also directed all officers to maintain sincerity and dedicate for the development and welfare of the district till then they are serving the motherland and even after as being a citizen of the country being a responsible citizen.